The latest bout of deadly wildfires in California has been raging for a week, taking at least 40 lives and leveling entire neighborhoods. Here's a look at the scale of the devastation and the resources mobilized to contain the blazes. The death toll currently stands at 40, but authorities expect it to rise as rescue workers account for the missing. More that 10,000 firefighters are fighting 15 blazes across Northern California. The operations include 880 fire engines, 134 bulldozers, 224 hand crews, 138 water tenders and 14 helicopters conducting water drops. More than 100,000 people have been ordered to evacuate their homes. The fires have destroyed 214,000 acres of land and 5,700 homes and buildings. 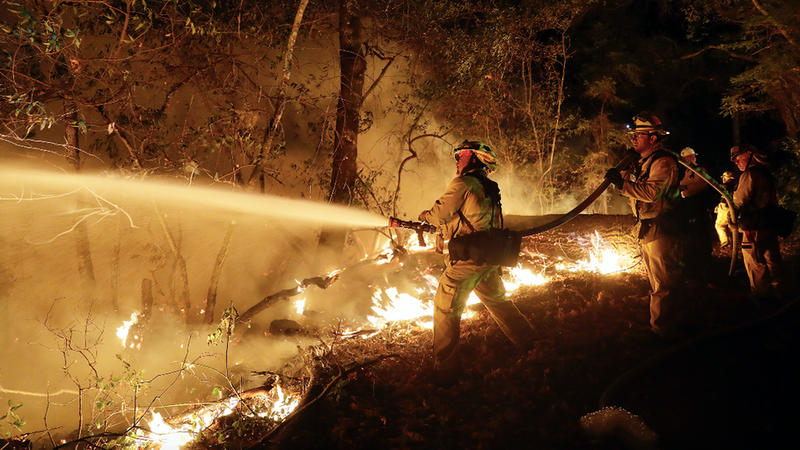 On Saturday night, 35 to 45 mph winds hindered fire crews' efforts and exacerbated the fires. The Tubbs and Atlas fires, two of the big blazes in Napa and Sonoma counties, have each been 50% contained. Another major fire, the Nuns, is 30% contained.